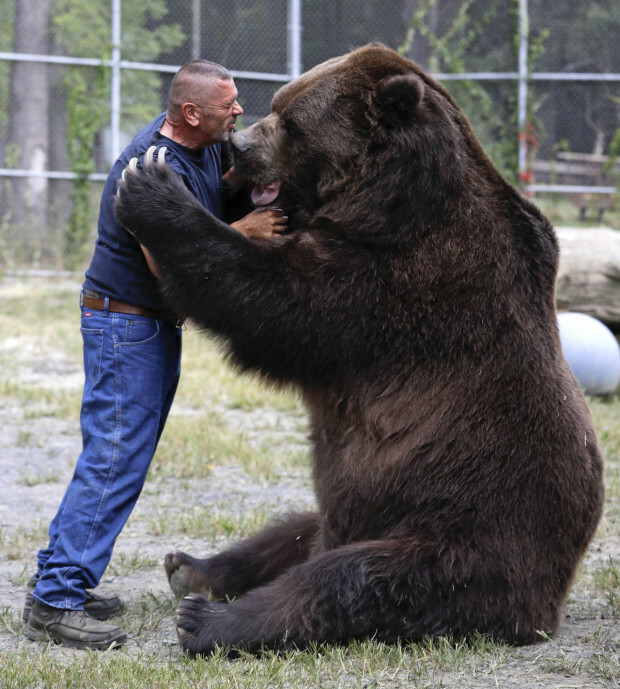 Kowalczik lies on the ground as his 1,500-pound bear buddy, Jimbo, rests a heavy paw on his waist. He feeds Jimbo a marshmallow from his mouth and laughs as a big bear tongue slobbers on his ear. If that sounds suicidal, consider that Kowalczik and his wife, Susan, have cared for Jimbo for almost 23 years, since he first came to the couple’s upstate New York haven for injured or unwanted animals as a bottle-feeding cub. Jimbo is among the 11 bears living at the couple’s nonprofit Orphaned Wildlife Center 60 miles northwest of New York City. One of them, a black bear named Frankie, was born in the wild and found his way here in 2012 after being hit by a car. The rest of the bears here were born in captivity, eight of them Syrian brown bears or mixes that came from a breeding program. Jimbo came from a West Coast game farm with an injured leg. There are plenty of wildlife rehabilitators and other centers that care for bears. But Kowalczik has grabbed attention for his hands-on approach. One Facebook video of him playing with Jimbo has received more than 16 million views. Kowalczik describes it as if it was something as natural as petting your dog. The bears are like his children, he says, and they have never injured him. The couple has been rehabilitating squirrels, ducks, deer, mink and other animals together since the early 1990s. The main goal is to release animals, but the bears here cannot be released because of injuries or because they are too accustomed to captivity. Bears are in 57-year-old Susan Kowalczik’s bloodline. Her father, Albert Rix, was a well-known circus veteran from Germany who raised Syrian brown bears. Jim, 60, is a retired corrections officer. The Kowalcziks funded the venture out of their own pockets until creating the nonprofit last year, which allows them to take donations. It’s still just them, plus director Kerry Clair, who handles administrative duties. The videos help with exposure. But experts are pretty clear: Do not get up close with bears, like Kowalczik does. Even with captive bears, there’s a chance their instincts will take over, says Matt Merchant, senior wildlife biologist with New York’s Department of Environmental Conservation. Plus, there are inherent dangers of rolling around with an animal that’s three-quarters of a ton. 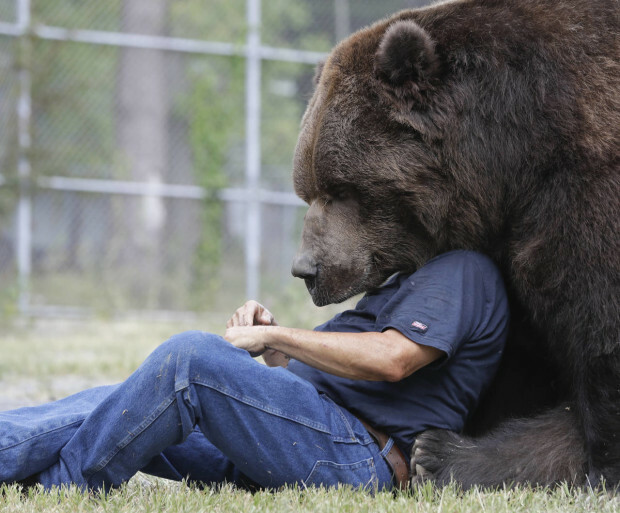 Sitting on the ground next to Jimbo, Kowalczik shrugs at the thought of personal danger from his bear buddies.